An online database of photographs and ecological information about the small tropical octopus Wunderpus photogenicus. These seemingly rare octopuses emerge slowly from the sand at dawn and dusk to hunt for small crustaceans, such as shrimp. Sometimes they only forage for about fifteen minutes, and then descend back into their dens. Nearly two decades after they were first photographed by divers in Indonesia they were given the scientific name Wunderpus photogenicus Norman, Hochberg, and Finn, 2006. Until then they went by the common name ‘Wunderpus.’ As with many tropical octopuses, we know very little about their ecology and biology. 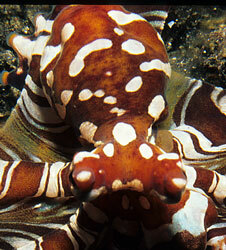 Wunderpus photogenicus is often confused with the “mimic” octopus Thaumoctopus mimicus. Please see this page to tell the difference between these two muck-dwelling octopuses. Wunderpix represents collaboration between divers, underwater photographers, aquarists, and scientists to understand more about Wunderpus photogenicus. 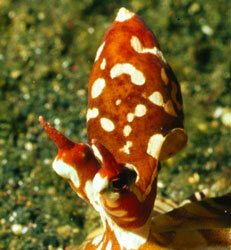 Unlike many other octopuses, individual ‘Wunderpus’ can be identified by unique spot patterns on their body, much like whales are recognized by spot patterns on their flukes. Divers take hundreds of pictures of W. photogenicus each year. By keeping track of these pictures in a central database we can track the whereabouts of individuals, estimate how many are out there, and begin to learn how long they live in the wild. If we can document the same W. photogenicus at multiple dive sites, then we can estimate how often they move around, and whether they migrate to breed. 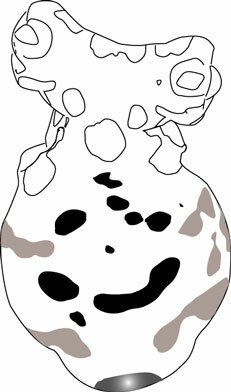 We may even be able use photographs to trace animals in the aquarium trade back to their home sites. Read more about Wunderpus photogenicus and photoidentification. View the Wunderpix collection in CalPhotos. Submit a photograph to the Wunderpix database in CalPhotos. When you register as a photographer with CalPhotos, be sure to mention Wunderpus/pix. You retain copyright of these photographs. Please see the Calphotos website for full details. By submitting a photograph and other information of W. photogenicus, you can help build the foundation of Wunderpix. We currently use the spot patterns on the central mantle (body sac) to identify individual adults, so it is important that we can see them clearly. The most useful images are high quality, in-focus shots taken from directly above. We also request information such as the date and the exact dive site (such as ‘Aer Perang,’ Lembeh Strait, North Sulawesi, Indonesia; GPS coordinates if available). Please have this information handy. If you are unsure about any information, it is important that you leave that field blank and only report what accurate information you have. As the data entry possibilities are limited, we encourage you to email us additional information. Once we have amassed lots of pictures we will need volunteers to help find matching shots of the same individuals. Page last updated October 29, 2008.